Vancouver, BC - Skyharbour Resources Ltd. (TSX-V: SYH) (OTC Grey: SYHBF) (Frankfurt: SC1N) (the “Company”) announces that it has purchased the remaining 40% interest in its Mann Lake uranium project in Saskatchewan from Aben Resources Ltd. (TSX-V: ABN). The 3,473 hectare property is strategically located on the east side of the Athabasca Basin approx. 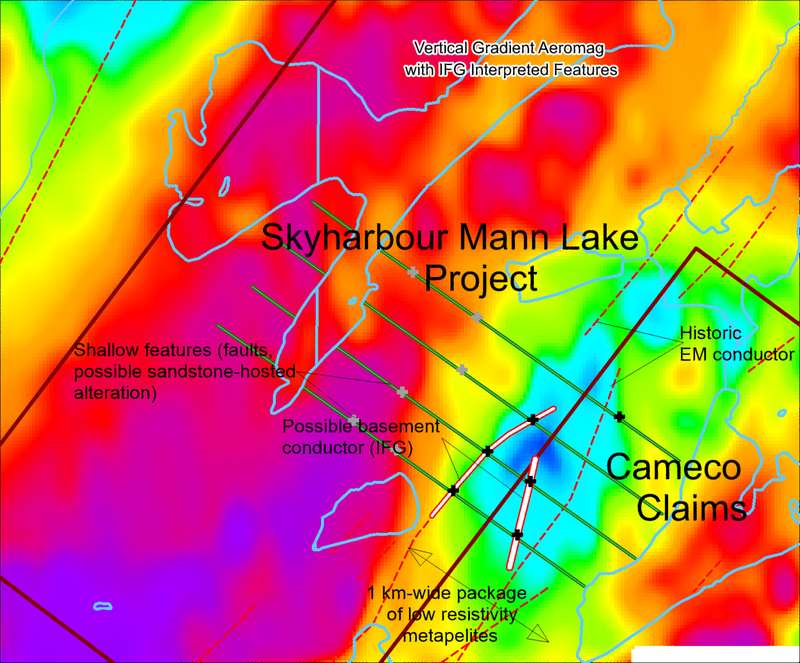 25 km southwest of Cameco’s McArthur River Mine and 15 km northeast and along strike of Cameco's Millennium uranium deposit. For the 40% interest in the property, Skyharbour has issued 1 million common shares to Aben as payment and now holds an undivided 100% interest in the project. Aben has retained a 2.5% net smelter royalty (NSR) in the Mann Lake property with Skyharbour having the right to purchase 1.5% of the NSR for $1.5 million. The Mann Lake property is also adjacent to the Mann Lake Joint Venture operated by Cameco (52.5%) with partners Denison Mines (30%) and AREVA (17.5%). Denison Mines acquired International Enexco and its 30% interest on the project after the 2014 winter drill program discovered high grade, basement-hosted uranium mineralization. The drill program intersected 2.31% eU3O8 over 5.1 metres including 10.92% eU3O8 over 0.4 metres (see International Enexco News Release dated March 10th, 2014). The Mann Lake Uranium Project has seen over $3.5 million of previous exploration expenditures including recent geophysics and two diamond drill programs totaling 5,400 metres carried out by Triex in 2006 and 2008. 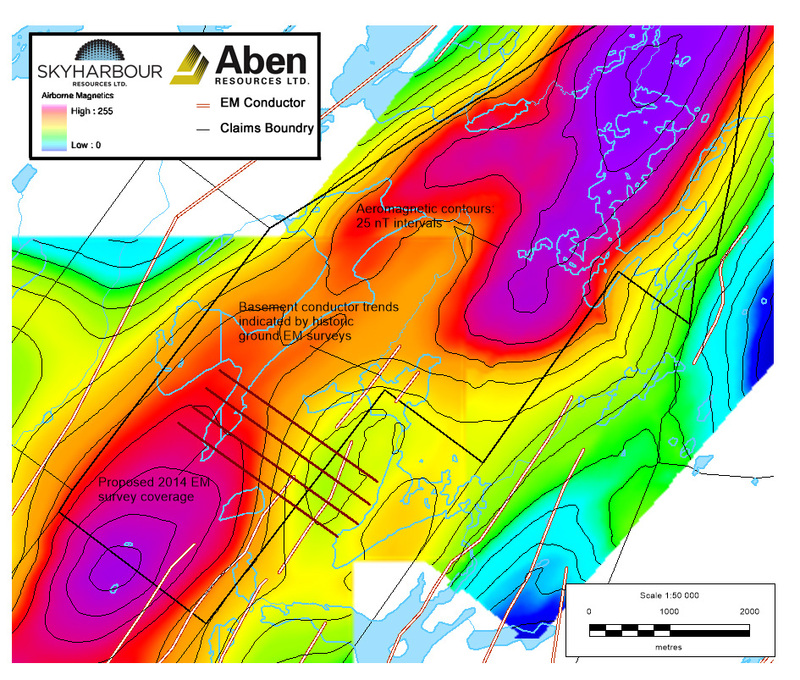 Skyharbour recently carried out a ground-based EM survey focused on a zone where a favourable, 2 km long aeromagnetic low coincides with possible basement conductor trends indicated by prior EM surveys. The survey was successful in confirming the presence of a broad, NE-SW trending corridor of conductive basement rocks which are probably graphitic metapelites. These features trend onto the adjacent ground held by Cameco. In 2006, a diamond drill program intersected a 4.5 metre wide zone of anomalous boron (up to 1,758 ppm) in the sandstone immediately above the unconformity in hole MN06-005. Boron enrichment is common at the McArthur River uranium mine, and along with illite and chlorite alteration, is a key pathfinder element for uranium deposits in the Basin. In the same drill hole, an altered basement gneissic rock with abundant clay, chlorite, hematite and calc-silicate minerals was intersected about 7.6 metres below the unconformity, and contained anomalous uranium up to 73.6 ppm over a 1.5 metre interval. Background uranium values are commonly between 1 and 5 ppm. Skyharbour holds interest in an extensive portfolio of uranium and thorium exploration projects in Canada's Athabasca Basin and is well positioned to benefit from improving uranium market fundamentals with four drill-ready projects. The Company owns a 100% interest in the Falcon Point (formerly Way Lake) Uranium Project on the east side of the Basin which hosts an NI 43-101 inferred resource totaling 7.0 million pounds of U3O8 at 0.03% and 5.3 million pounds of ThO2 at 0.023%. Skyharbour also has a 50% interest in the large, geologically prospective Preston Uranium Project proximal to Fission Uranium’s PLS Project and Triple R deposit as well as NexGen Energy’s Arrow discovery. 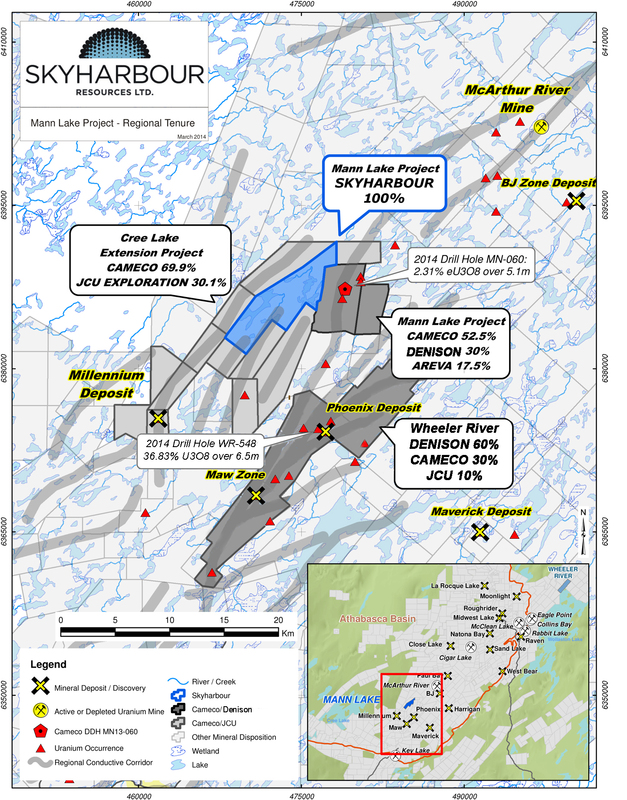 The Company’s 100% owned Mann Lake Uranium project on the east side of the Basin is strategically located adjacent to the Mann Lake Joint Venture operated by Cameco with partners Denison Mines and AREVA where high-grade, basement-hosted uranium mineralization was recently discovered. Skyharbour’s goal is to maximize shareholder value through new mineral discoveries, committed long-term partnerships, and the advancement of exploration projects in geopolitically favourable jurisdictions.